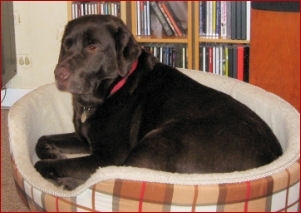 It was with great sadness that we had to bid farewell to Winston at the beginning of 2011. 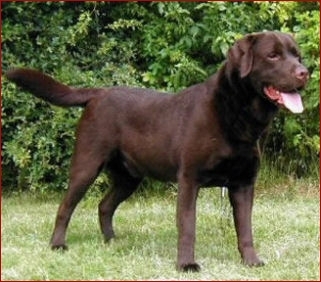 Winston was a prolific sire of chocolates and his contribution to our breeding programme over the years is inestimable, regularly passing on to his progeny his dark, rich chocolate coat, noble head, lovely dark eye and superb temperament. His descendants can be found working just as happily in the shooting field as they are as guide dogs for the blind, and we are comforted to feel that he lives on through them. In over 40 years of breeding, Winston was one of our particular favourites, and we could not have chosen a more wonderful home in which to spend his retirement than with Stewart and Clare Collins. As can be seen from the photo below, Winston soon adapted to the luxurious home comforts on offer and revelled in the individual attention. With their love and kindness, Stewart and Clare made his latter years extremely happy ones, for which we will be eternally grateful. We know that they, as we, are feeling the loss of this great chap enormously.